NewTek’s LVDT signal conditioners set the standard in reliability and ease of use. NewTek’s NTC-6000 signal conditioner is available from stock and compatible with nearly any AC LVDT or RVDT, and custom designs for unique applications and special considerations are also featured. 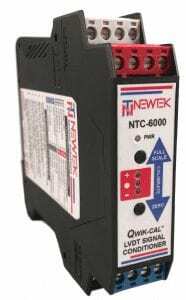 Often paired with AC LVDTs operating in harsh environments or extreme temperatures, NewTek signal conditioners are ideal for use in a variety of industrial applications including factory automation, materials testing, turbine control systems, steam valve positioning, packaging equipment and gaging. Since our products are designed in-house, NewTek can accommodate customization requests to conform to a specific package, non-standard analog or digital outputs, and heightened environmental ratings. The NewTek NTC-6000 Signal Conditioner addresses a wide range of applications for AC LVDTs, AC RVDTs, and inductive half bridge LVRTs. It’s flexible design allows for straightforward customization for specific requirements. It gives users the option to receive one of several DC outputs including voltage ranges, 4-20 mA current, or RS-485 digital. Designed in-house by NewTek Engineering, application engineers are available to answer technical questions or partner with customers for custom adaptations and designs. With stock on-hand for same-day shipment, the NTC-6000 can be delivered quickly for implementation in a wide variety of industrial applications including materials testing, turbine control systems, steam valves, and gaging. Because of its intuitive setup and easily accessible features, the NTC-6000 does not require technical personnel for installation. With simple setup instructions printed on the label, color-coded removable terminal blocks, and self-diagnostics, the NTC-6000 can be brought on-line in minutes to deliver reliable feedback. For specialized requirements, NewTek can design custom signal conditioning packages. 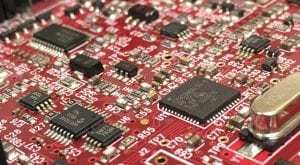 Custom signal conditioners can be made to meet specific mechanical envelopes, environmental conditions, temperature ranges, or contained in custom packaging or cases. Additional configurations are available including remote relay, digital, push-button calibrations, diagnostics, and cyber-security features. Outputs can be bipolar or unipolar DC Voltage, DC Current, and digital including CAN Bus, Modbus, RS-485, and more.